I have officially been a blogger for one whole year. Since a year ago I have moved across the country and become a legal adult. I’ve received the Billy Mitchell Award in Civil Air Patrol, changed my college plans 4 times in 4 months, done a play from backstage for the first time ever (will do a longer post on that in future), and have started preparations to go where I never thought I’d go for school. In all it has been a wild ride and I only wish you’d been able to come along for more of it. What I’ve learned through this whole year is that you can’t blog about everything. It’s weird to do recipe reviews alongside life lessons, with a dash of short stories. While preparing for the SAT I’ve considered posting essays I do for reading and reviewing by my dear readers, but that never has seemed to fit in anywhere. Basically this whole year I’ve been trying to find my little corner of the blogsphere. I don’t blog like my friend Erin who can do almost everything and it some how fits into her style of blog (seriously, I have know idea why but it’s true), I’m not like the typical writers/nanoers blogs who talk about writing and post bits of their stories. However, I don’t want to make this a fitness blog either ( I kind of set up a separate one for that if anyone is interested in following my fitness climb). It’s taken me a year to realize this, but I like talking about myself. In reality I feel awkward talking about myself too much, and it has nearly killed me to brag about myself on all these college applications. This is in complete contrast to my biggest vice, which would be pride. Yes, I’m a prideful person with the most ridiculously strong honest streak ever, and can’t brag about herself for any application or friend in the world. So what i mean when I say I like talking about myself is that I like sharing my opinions, letting people know what I think, what I like, and what I’m doing. Now, don’t get to excited or self conscious. I am not rich, I do not go on crazy expensive vacations every Summer to the beach, and I have never been to an amusement park, let alone ride a roller coaster, so this may end up being a dismal failure and the most boring blog in the history of Me blogs. Seriously, I am the girl who either wins or comes in second during the “never have I ever” game, if any of you have played that before. This blog will literally be me trying to overcome every self conscious bone in my body and live to the mantra that my old Drill Team leader, Lt Col W taught at a leadership class. I can’t let something small I screw up on cling to me for the rest of my life. It isn’t healthy, and with my career plans will jeopardize my future if I can’t nip it in the bud. I have to learn to brag (on paper at least), accept who I am and the mistakes I make (that would be my pride there), and perhaps learn some time management as well. That’s not to say every post I do will be me talking about my “feelings” or mistakes I’ve made, or things like that. If I have something I wrote that I really want to share or a book I read I want to give my opinion on I will. But I won’t force myself to write anything I don’t want to post. This is no longer the mish mash blog I started it as, but I am now giving it a purpose. Year One was finding my corner, and new friends, in this crazy little corner of the web. Now this next year will be the true Year One, Year One for me to get this blog really going. This year I’m making this blog Mine. And now for the boring stats you really have no interest in, but that I want chronicled for five years from now. Next year’s Blogiversary Post will be much cooler, I promise. And I’m sorry if I restated a lot of what I said a couple posts back, but I felt like I needed to cement it, having only just come up with a plan on how to make this a real Me blog. My apologies for dropping off the face of the earth. As I’ve mentioned, school is taking up a great deal of my time currently. I wanted to let you know that I just completed a half marathon! That’s right, I ran 13.1 miles, without stopping! Now, time for a little backstory so you all understand why this accomplishment means so much to me. I have been overweight since I was little, and was obese at 11. Because all of my friends were awesome, no one would tell me outright that I was a little on the chubby side. I didn’t start really losing weight until I was about 15, which was also around the time I started really thinking about what i wanted to do with my life. The Air Force kept pushing its way into my mind. When i finally decided, yes, I want to go for this, I knew I really had to start pushing myself, and working hard to get fit for the demanding physical requirements. At that time my greatest hurdle, physically, was (after push-ups anyway 😛 ) running. I hadn’t been a “runner’ since I was 9, and at age 14 I could barely run for about 20 yards. I always wanted to run, ever since I’d read this article on running and cross country in a magazine. I just never believed that I could do that. a mile, maybe, because a mile was long. But anything further, let alone a half marathon, forget it! As luck would have it, we lived in a suburban area with a bike trail at the time I started my training ( age 16). I joined Civil Air patrol, where I needed to do a timed Mile run once a month, and come in under 12 minutes. And Now here I am, a year later, standing (or more correctly, half collapsed 😛 ) at the end of a 13.1 mile course, which I completed in 3 hours exactly. Believe me, I had plenty of time to look back on my past unfit self, and think of how I had dreamed of doing what I was doing at that moment. By the time I crossed the finish line, and the volunteer there hung that finishing medal around my neck, I wanted to cry. I’d only ever dreamed of doing something like that, but never believed i really would! Now here I am, fitter then I have ever been, and still working hard to grow even stronger. Today I accomplished a dreamed. I half-sprinted (wish it could have been a full sprint, but I wasn’t able to make it to that before reaching finish line) across a finish line after running, sometimes jogging, once or twice dropping to a power walk, for 13.1 miles. To some people, it may seem small. I ran a race, so what? I’ve run hundred of full marathons!” or something like that, but for me, that half wasn’t just 13.1 miles. It wasn’t just a number. It was a sign. It was me proving that I can do anything I want. It was me proving I never have to go back to what I was 4 years ago. I’m doing a blog chain! I have always wanted to do one of these! Once again, you have a lot of freedom with this topic. While the character(s) you choose should hopefully come from a published work, it can be from pretty much any type; book, movie, musical, short story, poem, etc. characters are all fair game. What Characters am I most like? 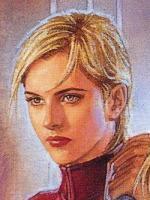 Siri Tachi is a character created by Jude Watson for the Jedi apprentice series. She is a jedi padawan who becomes Obi-Wan’s best friend during his apprenticeship. She’s only slightly younger then him, but skips 2 classes to be at his level. She is a sarcastic, pushy, headstrong, and fiery jedi. It’s her mannerisms and characters traits I connect with most, over her actual life experiences. I wish I had her life, but that’s pretty much all I can do. I have her temper, her tendency to act without thinking, and her ability to conform to any situation. I also have her sharp tongue. Attolia is the title of the ruler of Attolia in the Queen’s Thief series. Once crowned, the rulers of the three different kingdoms that take center stage in these almost Greek epic like stories, are pretty much only referred to by their titles. Her lesser known name is Irene. Okay, spoiler alert, but this character starts out as more of a villain in the first two books. In the second book though, you get to see things from her perspective, and you realize she’s not so much a villain as a queen struggling to hold together a traitorous country as the sole ruler. And a women ruler at that. She had been the subject of court intrigue since a child, and only came out of the shadows when both her father and older brother died, putting her on the throne, and in the middle of a big split between her country’s noblemen. Each one had their own agenda, and each one wanted her to be used for their own personal gain. It took quite a bit of craftiness from her side to take control on her own, and break all the strings that were being pushed on her. It took years for her to balance the national treasury from the noblemen’s spending, and to shove it into people’s heads that she was ruler, not them, and that she was not marrying anytime soon. In short, Irene is a queen who’s heart wasn’t stone, but which circumstances had made firm and resolute. Andrew (or Ender, as he likes to be called) Wiggin is just a little kid at the start of the first book. In the movie, he’s a bit older at the start, but that doesn’t have anything to do with Ender himself. Ender is a third. he’s a government approved third child, which makes him immediately a target and an anomaly. In his futuristic world, aliens have attacked earth on two separate occasions. there can not be a third. So, the world comes together and creates a battlefleet. But they need a commander. And so start the schools. Battle schools. Those who pass certain requirements on earth are sent to the satellite battle school which orbits earth. There they start a whole different level of training. they become soldiers there. Not just soldiers, leaders. What I love about the school (umm… besides the training 12 year olds to attack and fight a war part. That isn’t as good.) is the leadership, and the leadership skills Ender possess. I love leadership. I love reading about… I love the opportunity to be a leader. I was a Civil Air Patrol flight commander for the last month before I had to move from my old Squadron, and I have to confess, it was the best position I have ever had and I was just flying high. Ah! My childhood hero! Jo has always been my favorite March sister. She’s a tomboy, a writer, and a playacter (at least in the March home’s attic). She is just so me, and I’ve always loved her for that! She has a younger sister who tries way to hard to be like her older sister. I sadly, am minus a little Beth with no faults to put her kindly in her place. She also dreams of travelling to far off lands, but is for quite a while stuck at home. Though, she couldn’t really call it stuck, for she does love dearly her little family and home, even if she rarely says so outright. The first book I read in this series was The Final Warning. My absolute favorite is Max. 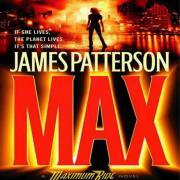 Maximum, or Max as she called, is the leader of a “flock” of genetically enhanced humans who contain 2% of bird genes. I.e. they have wings. She’s the “big sister”, the leader of these kids. She can be bossy, short tempered, but always has the needs of the flock at heart. Sometimes the others don’t see it, or get tired of having an older sister, but it’s not long before they realize how much they need their over bearing Max to see them through. And those are it. Those are the characters I am most like. In truth there may be a couple more, but who wants to listen to me list off characters I am like all day? Instead, go check who else is doing the blog chain! 14th – http://erinkenobi2893.wordpress.com/ – Yay! Erinnn! If you’re interested in looking at past blog chains, or participating in future, here’s where to look!